“It’s not easy to stay alive with a $1,000 bounty on your head.” In 1967, a bullet cost thirteen cents, and no one gave Uncle Sam a bigger bang for his buck than the 5th Marine Regiment Sniper Platoon. So feared were these lethal marksmen that the Viet Cong offered huge rewards for killing them. 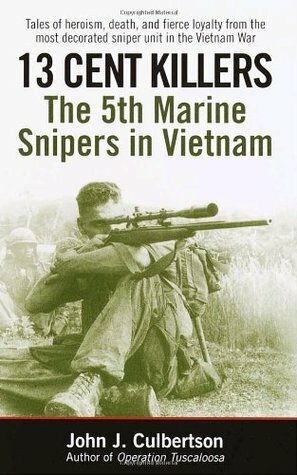 Now noted Vietnam author John J. Culbertson, a former 5th Marine sniper hims “It’s not easy to stay alive with a $1,000 bounty on your head.” In 1967, a bullet cost thirteen cents, and no one gave Uncle Sam a bigger bang for his buck than the 5th Marine Regiment Sniper Platoon. So feared were these lethal marksmen that the Viet Cong offered huge rewards for killing them. Now noted Vietnam author John J. Culbertson, a former 5th Marine sniper himself, presents the riveting true stories of young Americans who fought with bolt rifles and bounties on their heads during the fiercest combat of the war, from 1967 through the desperate Tet battle for Hue in early ’68. In spotter/shooter pairs, sniper teams accompanied battle-hardened Marine rifle companies like the 2/5 on patrols and combat missions. Whether fighting their way out of a Viet Cong “kill zone” or battling superior numbers of NVA crack troops, the sniper teams were at the cutting edge in the art of jungle warfare, showing the patience, stealth, combat marksmanship, and raw courage that made the unit the most decorated regimental sniper platoon in the Vietnam War. Harrowing and unforgettable, these accounts pay tribute to the heroes who made the greatest sacrifice of all–and leave no doubt that among 5th Marine snipers uncommon valor was truly a common virtue.